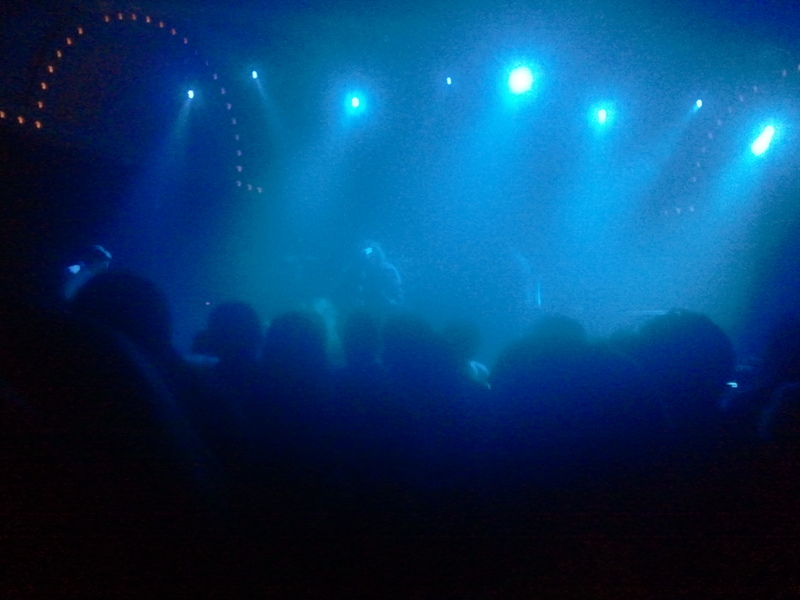 It’s only been a few short months since we last saw The War On Drugs live in Portland, and the upgrade in venue from the Wonder to the Crystal matches their surging popularity over the course of this year. When we last saw them, the band had just released their latest album Lost In The Dream to stellar reviews and they seemed poised to break through into the mainstream; eight months later, as Lost starts appearing at the top of everyone’s lists for album of the year and the band has a bona fide radio hit with “Red Eyes” (which by kicking off KNRK’s “December to Remember” series of concerts last night confirmed), it’s clear that The War On Drugs have arrived. And just as they did back in the spring, the band came through with a spirited set that left an even larger audience buzzing. Thanks to the bizarre layout mandated by the OLCC, a solid dead-center shot for this pic. After months of touring, the band’s setlist is a well-oiled machine: a strong natural flow has developed between the ballads and uptempo material, and the transitions between songs have now been smoothed over to minimize the delay for tuning and pedal adjustments. As to be expected, material from Lost In The Dream dominated the setlist, with eight of the ten tracks represented (only the instrumental “The Haunting Idle” and the dirge-like “Suffering” failed to make the cut). The peppy “Burning” made for a strong opener and set the mood, but it took the opening clicks of “Under the Pressure” for the crowd to begin making some real noise. That was nothing however in comparison to their response to “An Ocean in Between the Waves”, which due in no small part to its extended solos received a generous applause and some hollers. It’s clear that despite the affection the crowd had for the band and the new album, it didn’t inspire most of them to go back and pick up the early material, as cuts from Wagonwheel Blues and Slave Ambient were met with only the occasional cheer. 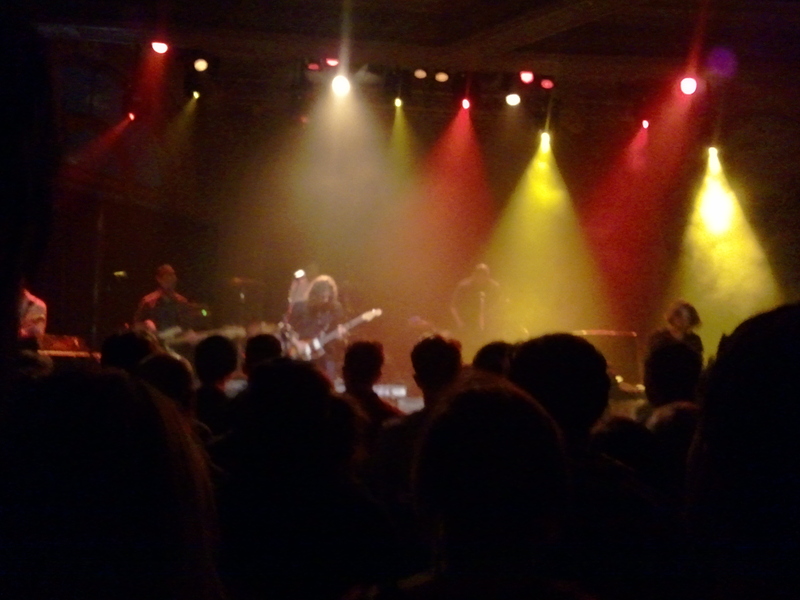 It was during these songs that The War On Drugs fell victim to the Crystal Ballroom Curse, as the overlapping of several effects pedals and similar-ranged instruments created a dense morass that made it hard to distinguish what was being played, even beyond the hazy effect intended by the material. “These Arms Like Boulders” and “Come to the City” are gorgeous songs if you are familiar with them, but to the uninitiated can seem like mush, though the latter benefited from some nifty drumming that caught the eye of the crowd. As many who have been to shows at the Crystal can attest, you need a top-notch sound man handling the mix or else everything can turn to crap. Adam Granduciel kept the evening friendly with his crowd banter, talking about his love of Portland and how he was looking forward to seeing the Blazers play the next night at home (and he endeared himself to the crowd when some folks tried to correct him about the new name of the arena by saying, “It will always be the Rose Garden to me.”) It didn’t seem at all like the band was weary from touring consistently for nine months, but instead that they had just hit their stride and were generally appreciative of getting to play another show. The show still felt fresh, even if it was a similar script playing out each night. As one would expect, “Red Eyes” had the crowd going nuts, but as it happened at the Wonder, “Eyes to the Wind” was the true highlight, with the fans giving that performance a hearty cheer to end the main set. The encore left the casual fans a bit cold, but since they had heard what they came to hear, they couldn’t complain; meanwhile, I enjoyed going crazy at hearing “Baby Missiles” and its infectious beat once again. And that was enough to help make the walk out the door seem twenty degrees warmer than the one coming in. As for the opener, Summer Cannibals delivered a killer set of garage-influenced punk, a bit of a more harder-edged version of the Dum Dum Girls. We had caught them earlier this year when they were the first openers for The Thermals down in Salem, but at least this time we were able to track them down and actually get their album. We’ll see if it’s as good as their live show.